So it is super late and I should be going to sleep... but I promised myself that I could blog if I finished submitting all of my projects for my ESL class!! 3 classes down, 3 to go! Next is multicultural children's lit. I literally can not tell you how SUPER EXCITED I am. I will be sure to share any books with all my blogging friends!! Today I was looking at facebook before school started, and I saw that my boyfriend had written about the live penguin cam from SeaWorld San Diego. Have you seen this?? Amazing. I used it as a reward for my class today after they worked on their persuasive paragraphs. They loved it! I actually find it amazing that 2000 people were watching at noon and still at 12:30 in the morning there are 1300 people watching it! They are adorable. It was PERFECT to introduce opinions and reasons! We are writing our persuasive paragraphs on healthy choices, so each kid picked a specific healthy thing to do and they are persuading someone to do it! I didn't think they'd be super interested in the topic, but they are loving it. Today I learned that we should get more sleep because if you're mad about something and you go to sleep, you "kind of forget about it." Haha! So there are your wise words from a second grader today. Side note - still watching the penguin cam... so cute!!! And lastly, I wanted to leave you with this Hey Girl. I have not left you one in a while because none of them have really grabbed me I guess! And I am only posting this one because it has Jude Law and I want to MARRY HIM even though he cheated on his fiance......... Jude, Jude, Jude. Shame on you! I don't know what wraparound services are but I hope if you do, that you love this one. I bet your kiddos loved the penguin cam. What a great motivator. I love that you teach a 1st and 2nd grade multiage classroom. Way back when I did my student teaching, I taught in a 1st and 2nd grade multiage room. I was so nervous, but I ended up really loving it. I ask my principal all the time if we can have one at our school. I would love to have you stop by my blog when you have some time. LOVE the penguin cam!!! So cute! I only had one student today, so we watched, only after she finished her work of course. :) We got to watch them being fed, so much fun! Thanks for sharing! 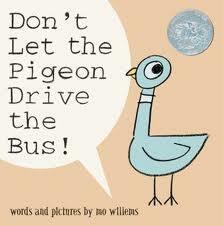 I just recently heard of Mo Willems and his books through some other teachers. They seem like fun books, looking forward to getting some! A few years back, when I was teaching 2/3, we discovered the Africam. It was like CRACK to the kids. They would come in and check it daily. I had to create a special job JUST to watch the cam. One day we saw a lion and you would have thought I told them they each had won the lottery and never had to come to school again. We are also writing persuasive essays...I never thought to use the Pigeon book! Good call. I love the picture! It totally just made my day! Thanks for sharing a persuasive writing idea, we haven't really delved into this writing style yet, so this is good! I think I'm change averse, I still prefer Ryan Gosling.